College football is quickly approaching -- we’re 24 days away from the Gophers’ season opener on Aug. 30. So, with that in mind, I’ll take a look at Minnesota’s 12 opponents by asking five questions to a beat writer covering that team. Today’s installment is Game 10, Purdue. 2017 record: 7-6, 4-5 Big Ten; defeated Arizona 38-35 in Foster Farms Bowl. 1. 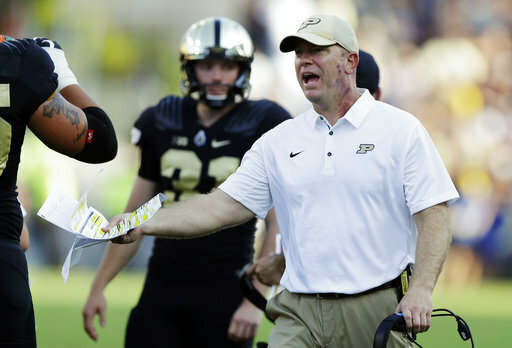 Jeff Brohm took Purdue from 3-9 to 7-6 with a bowl win in his first season in West Lafayette. What does he do for an encore? Win eight games? Based on the schedule, that's probably not realistic. However, the standard of reaching a bowl game has now been set and that's the goal for 2018. Purdue plays a tougher schedule and won't surprise anyone this year. 2. Quarterbacks David Blough and Elijah Sindelar both suffered significant injuries late last year. How is their health and how do you see Brohm using both this season? Both participated in summer workouts. In fact, David was full-go in spring practice about four months after suffering a fractured ankle. Elijah didn't do anything in spring practice other than throw. I expect both quarterbacks to be ready to compete for the job. I suspect we'll see both quarterbacks throughout the season. 3. The Boilermakers allowed 38.3 points per game in 2016 but improved dramatically to 20.5 (24th nationally) last year. They suffered significant losses to graduation, so how do they sustain that momentum on defense? It will be hard for the defense to match last year's success, let alone surpass what the group accomplished. This defense is going to be young and inexperienced. They have four returning starters but plenty of new faces decorate the depth chart. The first month of the season will be interesting to watch unfold to see what happens. … The offense is humming along, and the defense has settled in by early November. … If Brohm is still searching for playmakers on offense, especially at receiver, and the defense struggles to make stops.